We adopted an adorable female kitten about 3 weeks ago. We believe a rodent ate her paw days after she was born. She did have a partial amputation of her left rear leg, which had healed very well. Our concern is that she is using her stump and “hobbling” around on carpeted surfaces, which is irritating the soft tissue on the end of her stump (like a rug burn). On our kitchen tile, she keeps her stump elevated and uses her 3 legs to get around. Any recommendations or suggestions? We hate to completely limit her to the kitchen until she gets bigger. Thanks! Hey there I’m so glad you decided to post here, it was nice talking with you in the Tripawds Chat room. I’m not a vet, but what I have learned from talking to orthopedic and rehabilitation therapy specialists, is that when extremely young dogs and cats lose a limb, it is often more challenging for them to learn how to maneuver around. They haven’t developed motor skills yet the way an older animal does, so they will start trying to do things as best they can, usually awkwardly and not good for their body mechanics. When it comes to a partial amputation, we see this happen a lot with all ages of dogs. They try to use the stump and then eventually it leads to gait and spinal issues. You had asked me if you can train her behavior out of her, and honestly I don’t know. But what I can tell you is that an evaluation by a rehabilitation therapist may be able to reveal what her future holds with that stump. An amputation correction surgery may or may not be necessary for her to have full function on three legs. The best way to know that is to talk to an expert. And if you decide to see a rehabilitation therapist, the Tripawds Foundation may pay for your first rehab visit so we hope you’ll take advantage of that program. The main benefit to leaving a stump on an animal is if the pet parent is willing financially and time-wise, to train the animal to use a prosthetic limb. Your cat may or may not be a good candidate. An orthopedic surgeon can tell you. Our posts about prosthetics explain more, just click on the link. I hope this helps. What’s your cat’s name? Thank you so much for the information you provided. 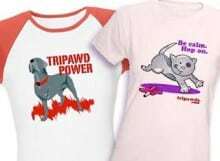 Tripawds has been a wealth of information, and we are grateful for the support and resources. We did have a follow up appointment today with our vet, and after further evaluation, she determined from an x-ray that Maisy has pieces of her tarsal and metatarsal bones still attached to her fibula, with one bone in particular that is literally turned and is running parallel to the fibula. That bone appears to be pressing on a nerve, so it looks as though amputation surgery is in our near future. Until then, I will certainly keep researching your site as we prepare for surgery and post-surgery care. Again, thanks so much for your response. Glad you had a follow-up appt. and confirmed the remaining leg has to go I am sorry. These partial amputations always appear to cause issues if there is no prosthetic in the future. I imagine they want her to grow a little before surgery when are they suggesting surgery? it will save you loads of time digging for all the info on the site, and we are here to help answer questions you may have. Thank you all for so much great input and advice. Our kitty Maisy will undergo her back left leg amputation on Wednesday. We are a bit anxious on what to expect, so I did purchase the Cool Tips for Tripawd Cats book so that we can be prepared to give our little girl the best care post-op and beyond. We are thankful that the rescue organization we adopted her from is covering the operation. That is a huge relief to not have to worry about the financial impact. My hope is to start a blog for Miss Maisy to share our experience and her recovery. I will be sure to add the link under this posting once I get it rolling. You can add a new site here anytime, or – once logged in – click on My Sites in the admin bar at the top of any page and use the Add New button. Review your default post and Help Videos in your dashboard for lots of helpful tips getting started. Then you can update your Forums Profile to add a blog link in your signature so it appears beneath all you forum posts. Search or post in the Tech Support forum if you need additional assistance. Your little kitty certainly won the Kitty Lottery when she found her furever home with you! Just want to send extra pawsitive energy for surgery on Wednesday. Mince recovery is over, I think Miss Maisy will feel soooo Mich better with that vum lev gone! Aww best wishes to Maisy and you tomorrow! Let us know how things go, we’ll be sending you lots of pawsitivity. I hope our Trikitty book was helpful. Thanks for checking it out! Will be thinking of you, keeping fingers, toes, paws, and tails crossed for all of you Big hugs to everypawdy! Thank you all for your pawsitivity! We are thankful that surgery is over for our little Miss Maisy! Last night was a bit rough, but today is a new day! Maisy has been eating well, took her pain meds no problem, and is using her regular litter pan (her preference as she wouldn’t use my modified one). Of course now the fun begins with keeping her from messing with the sutures. We currently have both the cone of shame from the vet and the inflatable ring on her as she is super flexible and still able to reach them! I am going to try the onsie trick tonight to see if that helps. Again, I thank you all for your wonderful support as these forums and the tripawd site gave us the support and resources we needed to help our kitty. I am so glad she did well through the procedure, yay!! Definitely keep an eye on sutures/staples, they can do a lot of damage in no time flat! Eating, using her box AND taking her meds, total bonus! Miss Maisy is already eating and using her litterbox??? YAY!!! Excellent news!! You still have some rough days ahead, but sounds like she’s a determined and strong kitty and will get through this recovery time just fine!